"If you loved Hoosiers and Rudy, you will love The Mighty Macs!" The Mighty Macs based on the incredible true story of the 1971-72 Immaculata College team that started in obscurity, but became the original Cinderella story in women's basketball when a national champion crowned for the first time in women's basketball. This newly founded team of pioneers went from barely making that inaugural tournament to becoming the first dynasty in their game. And Cathy Rush, the woman that changed the game for the better, became immortalized when she was inducted into the Naismith Memorial Basketball Hall of Fame last year. 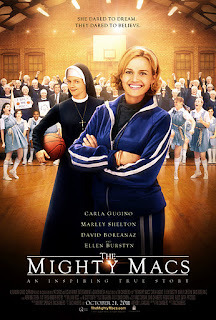 The Mighty Macs star Carla Gugino as Cathy Rush; David Boreanaz as her husband; NBA referee Ed Rush; Marley Shelton as Sister Sunday; and Academy Award and Tony Award winner Ellen Burstyn as Mother St. John. The Mighty Macs open in theaters on October 21st when released in over 1,000 theaters through Sony Pictures. Tim Chambers, writer, director, and producer of the true-life sports story, THE MIGHTY MACS, uses a successful formula to inspire the hearts of many. Critics believe this formula is overdone. 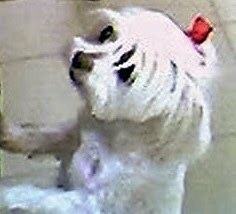 However, the audience will be the square meter of success for this type of story. Is there an appeal for moral ideals in feel-good stories about athletic events? I submit that the underdog story combined with the athletes’ struggle to be the best one can have the stamp of approval.